In the first trading session of September, the last before the National Day break, stocks surged sharply. 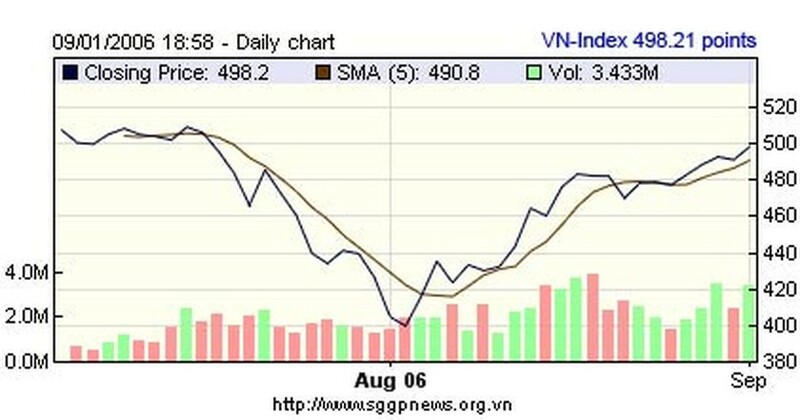 The VN-Index rose by 7.03 points to 498.21 points, the highest in one month and a half. Buying power on the market has grown fast recently. At closing, the total trading volume of the whole market reached 3.43 million shares and fund certificates, equivalent to VND164.61 billion (US$10.27 million), VND46.56 billion higher than that of previous session. 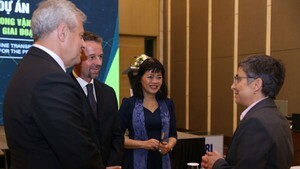 Many stocks, which were once market leaders such as REE of refrigeration electrical engineering’s ReeCorp, SAM of telecom materials’ Sacom, GMD of seaborne and forwarding agency’s Gemadept, KDC of sweet cake’s KinhDo kept their usual trading volume while new listings attracted significant attention from investors. Leading in trading volume was STB of Sacombank with nearly 600 thousand shares changing hands. The trading value of STB in this week alone roughly reached VND200 billion (about US$12.5 million). Other new stocks such as TYA of Taya cables, CII of HCMC Infrastructure Investment, VSH of Vinh Son – Song Hinh hydropower, VFC of Vinafco freight and forwarding, and VNM of Vinamilk also got buying orders in hundreds of thousands of shares in the session. Moreover, the market also has 1.5 million bonds changing hands in negotiations, in which Vietcombank convertibles reached a trading volume of VND321 billion (about US$20 million) since the beginning of August. On trading floors such as SSI and ACBS, investors are in good mood as they can enjoy the holiday with the increase in their assets’ value as well as the recover of the market promised a brighter future. The stock exchange will have a break to September 4 and come back to normal operation on September 5.